High Quality Antique Japanese Netsuke carving, 19th. century! Done in a fine style in ivory, perhaps a Norval tusk, depicting a man on a large Barrel. Condition: Superb, fine even wear, wonderful patina. Rare carving in attractive black Basalt, mounted on a costum wooden display stand, ca. 12th.-15th. century AD. The piece a part of a large Arch, perhaps with a depiction of Shiva or another major god in the center. It's depicts a larger female Deity with a sword and a smaller Deity with large round breasts at the leg in a dancing pose. Size: 26 cm. in it's permanent mount, 23 cm. alone. 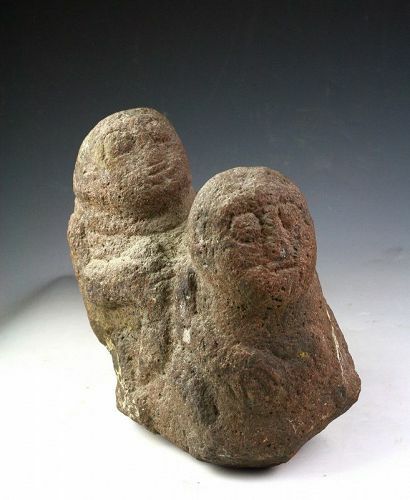 Very rare and unusual Hindu Sculptural antiquity! 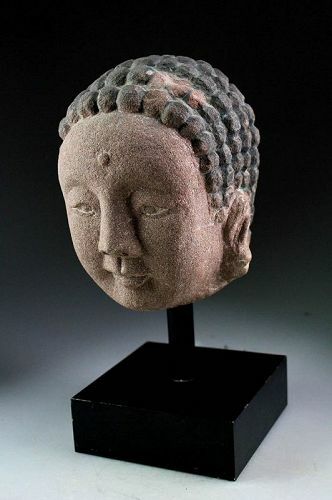 Finely carved from a redish stone with remnants of pigment. His enjoyable face is pleasantly made with an attention to detail, beautiful serene features. The back of the head is flat, probably to place it in front of a wall, perhaps in a niche. Elegantly mounted on a black costum made black plint in solid metal. Professional $500 work! Size: About 27 cm. when mounted, ca. 17-18 cm. tall and 13-14 cm. deep for the head alone. Superb Quality 19th. cent. Japanese Netsuke with Lion head turtle! One of the finest of the collection, a lion-headed turtle seated on a large turtle shell with flower, 19th. century. Small hole in the base and natural larger opening at one end of the shell. Size: 40 mm. wide, 22 mm. tall and almost square. Superb condition and really outstanding tiny details. Comes with our COA, and out of an important Old Collection, many pieces aquired and Christies and Sotheby's auctions. Rare Antique 18th. century Japanese carving of a Netsuke! Done in a fine style, depicting a man on a large sack. Condition: Superb, fine even wear, nice light patina. Rare 18th. century Japanese carving of a Netsuke with monkey! A rare Japanese Netsuke, early 18th. century. Done in a fine style, depicting a man tending a monkey seated on a large sack. Typical the earlier Netsukes were carved in left-over material from larger carvings, hence the often odd shapes. Superb detailed 18th. 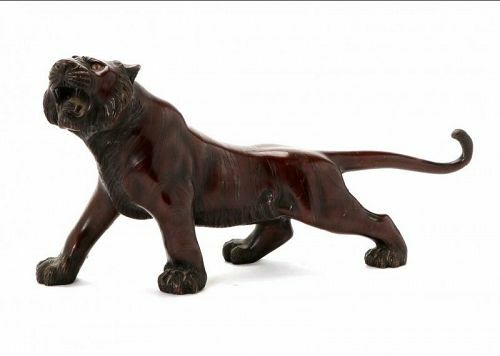 century Japanese Netsuke carving! An exceptionally detailed early Japanese Netsuke, dating to the late 18th.-Early 19th. century. One of the most accomplished Netsukes from the very old collection, we're handling. A seated man with a peculiar and finely engraved round hat and carrying a sack over his shoulder. The piece is finely decorated overall, also the fine base. A tour de force in the finest workmanship of the period. Terrific Early Japanese carved Netsuke, signed, mid 18th. cent. A rare and superb Japanese Netsuke, of a figural group, 18th. century AD. 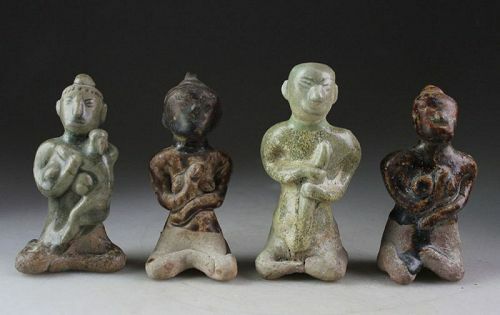 The figural group with an old man with a staff and a boy feeding a bird and with the usual two holes in the back. Signed on the base with fine clear characters. Note the terrific details of this group, including an inserted coral bead in the head of the bird! Condition: Choice, intact and with a remarkable patina, that is seldomly seen on the market. Interesting Tibetan carving of Dancing Deity, 18th-19th. century! Interesting and very old carving, likely for wearing as decoration, Tibetan c. 18th.-19th. century. The carving depicts a dancing Deity. The deity is centerpiece and flanked by two decorated panels seperated with carved beads. We bought this extremely fine piece as part of a vast collection of only antiquities. The piece has a fine genuine patina in almost orange of the back. We guarantee the above dating. Finely polished and of good style.